The Yacht-Master is the ultimate Rolex for skippers. You’ll be sure to stir up excitement at sea or the yacht club with this gold or platinum watch on your wrist. It's available in a range of sizes suitable for men and women. 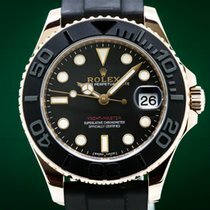 Rolex has a long-standing connection to water sports stretching all the way back to the 1950s: In 1953, they introduced one of the first diving watches worldwide, the Submariner. In 1992, Rolex premiered their watch for sailing enthusiasts, the Yacht-Master. Later, in 2012, prototypes of the Sea-Dweller survived the trip down to the Challenger Deep in the Mariana Trench, the deepest part of the ocean. At such depths, the watches had to be able to withstand more than 1,000 bar of pressure - a truly impressive feat. Thanks to the wide range of case sizes available – 29 mm, 35 mm, 37 mm, and 40 mm – the Rolex Yacht-Master is perfect for men and women. 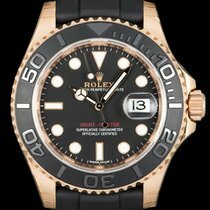 The Yacht-Master is available in Everose gold (rose gold) as well as bicolor combinations of Everose gold or yellow gold and stainless steel, the latter of which is nicknamed Rolesor by Rolex. Furthermore, a model made of a combination of stainless steel and platinum called Rolesium is exclusive to the Yacht-Master collection. The case and three-piece link Oyster bracelet are made of stainless steel, while the bezel and dial are made of platinum. Unlike the Submariner, whose bezel is unidirectional for safety reasons, the Yacht-Master's bezel is bidirectional. It can help you calculate the sailing time between two buoys during a regatta, for example. How much is a Rolex Yacht-Master? A 40-mm Rolex Yacht-Master in Everose gold with the reference number 116655 costs about 22,100 USD in mint condition and around 21,800 USD when pre-owned. The so-called Oysterflex bracelet is a real treat on this rose gold luxury watch. On the inside, it is made of flexible metal inserts, which are then covered with elastomer. The black Cerachrom bezel inlay and black dial match perfectly with the bracelet and contrast nicely with the Everose gold case and rose gold hands and indices. If you're a fan of bicolor watches, you will like the Yacht-Master with the reference number 116621. This 40-mm model is made of stainless steel and Everose gold and is held on the wrist by a stainless steel and rose gold Oyster bracelet . You can find never-worn models for as little as 13,200 USD and pre-owned ones for around 12,800 USD. Rolesium versions (ref. 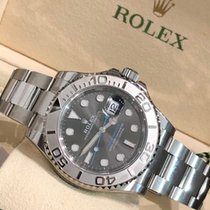 116622) are made of stainless steel and platinum and go for 11,200 USD in mint condition and 9,900 USD for a pre-owned example. What do prices for a Yacht-Master 37 look like? At 37 mm, the Rolex Yacht-Master 37 feels significantly more feminine than the 40-mm version of this luxury watch. The rose gold editions and two-tone versions in gold and stainless steel make the perfect companion for any fashion-forward women's outfit. As seen in the 40-mm Yacht-Master, models with an Oysterflex bracelet are the sportiest option. The Rolesium variant is also available with a 37-mm case. In mint condition, this luxury watch costs around 10,200 USD. A never-worn, 18-karat Everose gold Yacht-Master 37 with a black Oysterflex bracelet and the reference number 268655 goes for about 18,700 USD, while a pre-owned model sits around 18,100 USD. Two-tone models in stainless steel and Everose gold have a chocolate-colored dial and can be found under the reference number 268621. Prices for this timepiece come in at about 12,100 USD. Pre-owned examples cost a few hundred dollars less. Are you looking for the right watch for your next sailing trip? Then the Rolex Yacht-Master is right for you. With its 100-meter (10 bar, 328 ft) water resistance, you can even wear this sports watch while swimming. Exquisite materials, such as gold and platinum, further enhance these watches and make them the perfect choice to wear to the yacht club. A wide range of sizes - from 29 to 40 mm - makes these watches a great fit for both men and women. The Everose gold models, in particular, are an excellent accessory for stylish women. However, men can also wear these rose gold luxury watches and match them to their outfit. If you're looking to wear your Rolex Yacht-Master beyond the yacht club or your boat, you should take a closer look at the models made of Rolesium. These stainless steel and platinum timepieces are simple, elegant, and sporty at the same time, making them ideal for the office and everyday life. As is true of most every Rolex, Yacht-Masters have great value retention. The design of the Yacht-Master closely resembles that of the Submariner - from the celebrated Oyster case and the three-piece link Oyster bracelet to the crown protector and the date display with a Cyclops lens. Even the hour and minute hands and index markers are reminiscent of those on the Submariner. However, if you look more closely, you will notice subtle differences. The Yacht-Master's inscription and second hand are red, the crown guard is a bit bigger, and its case edges are rounded. The most noticeable difference is the bezel: The polished 60-minute graduations are raised, standing out against the matte background. In addition, its bezel can turn in both directions, while that of the Submariner cannot. In 2015, Rolex presented a Yacht-Master with an Everose gold case. The Genevan manufacturers opted for a scratch-resistant ceramic inlay and a matte black surface for the bezel. Its relief-like scale is polished, as is true of most Yacht-Master models. An Everose gold ring outlines the so-called Cerachrom ceramic disc. This model also marked the introduction of the Oysterflex bracelet, which matches perfectly with the matte black dial and the bezel. This caused quite a stir, since the Geneva-based manufacturer has always been known for its consistency and minimal detail modifications. The core of this patented bracelet consists of metal inserts made of a nickel-titanium alloy. They are then coated with black elastomer, giving the Oysterflex bracelet the feel of a rubber strap. These materials make the bracelet flexible, durable, and skin friendly. Two cushions on the inward-facing side of the bracelet on either side of the case help to increase comfort. They keep the bracelet from sitting directly on the skin, allowing air to circulate better between the arm and the bracelet. Aside from the various case size and material options, there are also several dials available. Traditional black dials create a contrast with the lighter index markers, which glow blue in the dark. Dark blue dials emphasize the watch's relationship to water and catch the eye immediately, jumping into view from far away. 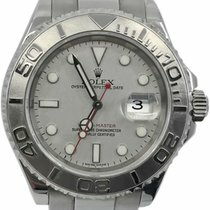 Rolex also offers dials made of mother of pearl or platinum. The caliber 3135 powers both the Submariner and the 40-mm Yacht-Master, providing both with a date display. Rolex introduced this caliber, now famous for its robustness and reliability, in 1988. It was used in the first Yacht-Masters in the early 1990s. Since 2005, the calibers have featured a blue Parachrom hairspring, which Rolex developed over the course of five years. The hairspring is made of a special zirconium-niobium alloy and is therefore unaffected by magnetic fields. It's thinner than a human hair and can withstand shakes and jolts up to ten times better than normal hairsprings. It also features a so-called Breguet overcoil, where the spring's last coil is raised, thereby reducing its curvature. This allows the spring to breathe better and improves the watch's precision. Like every Rolex timepiece, the Yacht-Master is certified by the Official Swiss Chronometer Testing Institute (COSC). The watch also undergoes further in-house tests with even more stringent standards than the COSC. The inscription Superlative Chronometer is on the dial to signify this rigorous testing. In terms of precision, this means that a Rolex watch may only deviate +/- 2 seconds per day. By COSC standards, a watch may only deviate by +/- 4 seconds per day. The smaller caliber 2236 powers the 37-mm version, while the 2235 powers the 35-mm version. These calibers also tick away in the watches of the Lady-Datejust collection. One highlight of caliber 2236 is its "Syloxi" hairspring, which was developed and produced in-house by Rolex. It's made of a silicon and silicon oxide composite, making it unaffected by temperature fluctuations and magnetic fields. Rolex has protected this hairspring with five patents, including one for its geometry. The coils increase in thickness as they move further from the center and are also spaced farther and farther apart. Rolex also refined how the ends of the hairspring are connected to the balance shaft and balance bridge. This results in a perpendicular, flat, self-centering movement. The escape wheel is nonmagnetic and made of a nickel-phosphorous alloy. Thanks to an optimized mainspring, the power reserve of this caliber is 55 hours. The Yacht-Master collection received a new addition in 2010 - the Yacht-Master II, a regatta chronograph. It's the first watch worldwide to feature a programmable countdown with a mechanical memory. Previously, this function was only available in quartz-powered watches. Unlike most traditional races, regatta races don't begin at the starting line. The racers wait near the starting line for the start signal. The Yacht-Master II's countdown function enables racers to get over the start line as quickly as possible after the signal. Taking all of its functions into consideration, the Yacht-Master II is one of Rolex's most complicated watches. 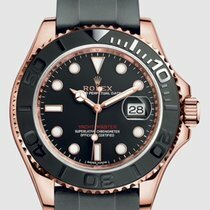 With a diameter of 44 mm, it's also one of Rolex's largest - only the 44-mm Deepsea can compare. However, Panerai has an even bigger watch: Some models of the Radiomir are 47 mm in diameter. The Yacht-Master II is available in more varieties than its sibling: stainless steel, yellow gold, a bicolor stainless steel and Everose gold (Rolex's own rose gold) model, and another in white gold and platinum. The stainless steel model is available for prices in the low five-figure range and is characterized by its white dial and blue bezel with an engraved inscription reading Yacht-Master II. The second hand, as well as the additional arrow-tipped hand for the timer, add red accents. With this large, sporty-elegant watch, you're sure to make a lasting impression, be it in the office or at the yacht club. The white gold and platinum model has a more subtle, yet also more refined, look due to its platinum bezel. This watch is an expression of prestige and costs around 39,400 USD. If you're a sailing fan searching for a new watch, look no further than the Rolex Yacht-Master . It was originally developed for sailors, though it looks just as good on land. Whether you're at the yacht club with your spouse drinking a glass of wine or discussing a new business plan with your colleagues at the office, you'll make an impression while showing off your passion for the sea. You have the choice between bicolor stainless steel and yellow gold or stainless steel and platinum models. If you prefer one color, take a look at the sporty Everose gold model, complemented by its Oysterflex bracelet and black ceramic bezel. With case sizes ranging from 29 to 40 mm, the Yacht-Master is perfect for both men and women.